With Ball Hop: Tiles Music!, you can play various genres of music, from beautiful Piano, Guitar songs to hard rock, metal rock, and EDM masterpieces. Bounce off the magic music tiles, listen to the beat, and make as many hops as you can in this mind-blowing music game now for Free! This game will create the whole new experience for music game lover. Be prepared to catch the magic beat now! How to play Ball Hop 1. Listen to the magic beat and use your musical reflexes to drag the ball left or right to guide the ball from tiles to tiles. In short, make the ball jump! Try not to fall off the magic music tiles. Do not Tap! This is not a Tap Tap game. Features: - Controlling the ball with one touch. - Beautiful backgrounds bring amazing feels for every play. - Many ball skins to choose. 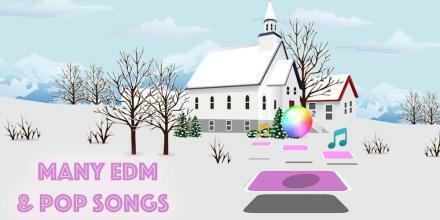 - Simple graphics, easy to play and everybody gets playing their favorite piano, EDM, pop, rock! - High-quality sound makes you feel like being in a concert. - Breath-taking rhythm will challenge your hand’s speed limit! Let’s roll the sky ball and enjoy the amazing musical journey in every play.